Richmond was known as Shene (meaning Shelter) from c.950 until 1502, when Henry VIII rebuilt the palace here after it had been burnt down by fire a year earlier. 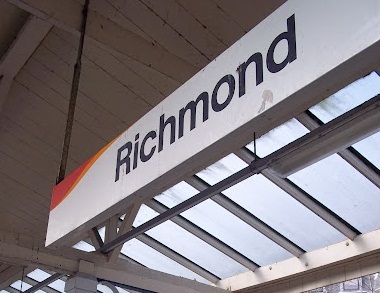 He called it Richmond (or Richemount) after his earldom so named in Yorkshire. This, in its turn, originally came from a name of a place in France. So modern Richmond obtained its name in a roundabout way. The original London & South Western Railway station was opened as RICHMOND on 27 July 1846. The terminal station platforms were opened by the LSWR for the use of their own service from Hammersmith on 1 January 1869 and North London Railway trains from Broad Street. District Railway trains began on 1 June 1877 and the Metropolitan Railway served it between 1 October 1877 and 31 December 1906.